Just as a building’s foundation lays the groundwork for a structure, child-initiated play lays a foundation for learning. Through imaginative play, children learn to interact with others, recognize and solve problems, and gain confidence. Play helps children make sense of their physical and social worlds and their place within them. We invite our youngest visitors and their families to enjoy this space as they explore the world we build for ourselves. As with the Museum’s other exhibitions, the Building Zone is free for members. Otherwise, Building Zone entry is included in the admission ticket for all Museum exhibitions ($7 per child, $10 per adult). Admission to the Building Zone includes 45 minutes of play time. Building Zone play times start at 15 minutes after the hour and run to the top of the hour. Last entry is 3:15 pm. Find more Hours & Admission information. The Building Zone. Photo by Kevin Allen. This gallery is designed for children ages 2 to 6. 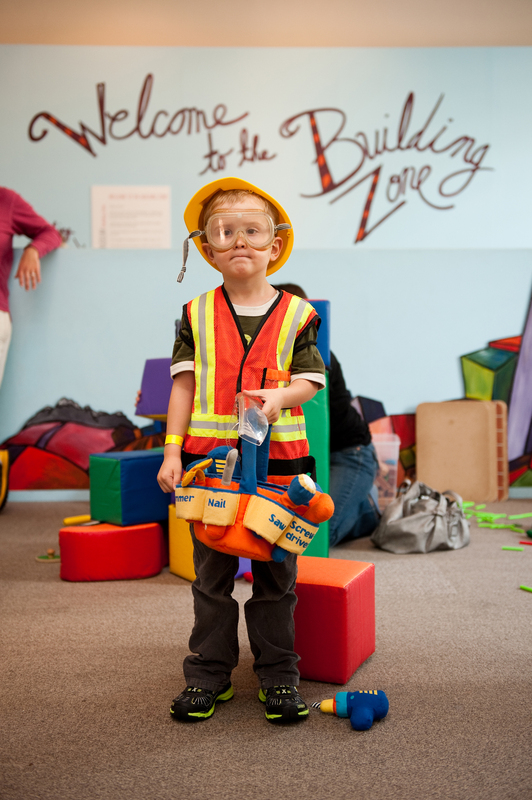 Admission to the Building Zone includes 45 minutes of play time. Tickets are available on-site only, and are sold on a first-come, first-served basis. Tickets may sell out in advance. No food or drink is permitted in the gallery. Maximum capacity is 40 visitors. Special Note for Groups: the Building Zone is designed for family visitors. The Museum reserves the right to ask groups of 10 visitors or more to split into smaller groups when visiting the exhibition. Peak visitation hours are 10 am–Noon. The National Building Museum gratefully acknowledges The Morris and Gwendolyn Cafritz Foundation for its support of the Building Zone.